Cacti, short for CAtegorical CreaTive Inventory, redesigns the creative inventory to enable more immediate access to mods' creative tabs. When many mods are installed that add custom creative tabs it becomes cumbersome to page between several tabs while using the creative menu, to resolve this Cacti groups every mods' tabs into their own category. These categories are displayed as tabs on the side of the menu. For mods with many tabs, Cacti provides the ability for them to categorize their own tabs with the Cacti API. By default the categories are displayed on the left of the GUI, this option allows you to toggle it to the right in case it is more convenient. Mods which only add a single tab will be put under a "Grouped Mods" category when this option is true, by default it is false. If this option is true when the GUI is opened it will return to the previously opened tab, true by default. Please report bugs and submit feature requests here and when submitting a bug be sure to follow this guide. Source code for this mod is available on GitHub, here. You can read the usage guide for the Cacti API here. Cacti adds one texture, cacti/textures/wigets.png. 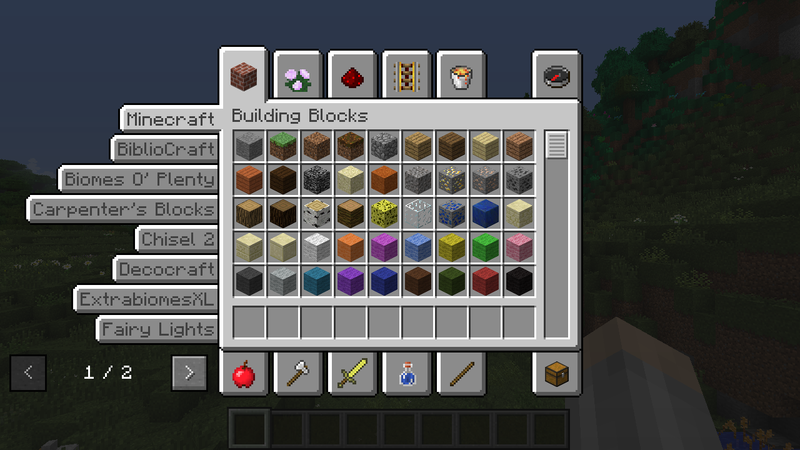 In order to support it your resource pack must also have minecraft/textures/gui/container/creative_inventory/tabs.png or else rendering will switch to using the button textures from minecraft/textures/gui/widgets.png.